This soup is even more instant and easy to make than this one...and a lot more tasty, authentic, and flavorful. That's probably because it's made with REAL miso paste, and not from one of those just-add-water packets. Simply simmer vegetable broth, then add cubed tofu, green onions, and spinach until the greens are wilted. Finally, stir in some miso paste (but DON'T bring it back to boiling) until fully dissolved, and you're done! Seriously, this took me probably all of 5 minutes. The soup is rich and full of that wonderful umami flavor, probably because red miso paste (instead of the milder white or yellow varieties) is used. That stuff is salty, fermented, and rich...yum yum. 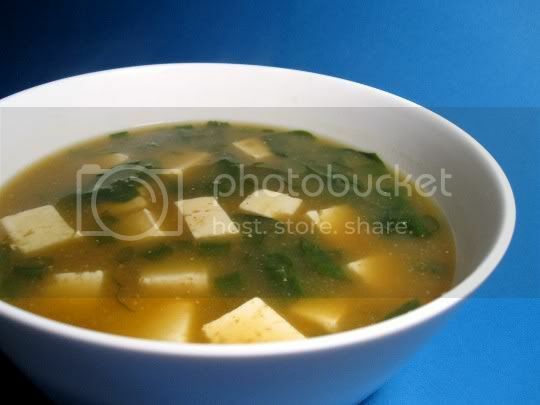 The greens add some texture, and the tofu really soaks up the broth and fully flavors it. One serving is really just enough for a small starter, so double it if you want a more soup-like course. Make again? Yes. A five-ingredient recipe to a guaranteed vegetarian/vegan miso soup in less than five minutes. Yum!